HOW I GOT THIS BOOK: I thank Naheed Hassan of Indireads for sending me this book in exchange of an honest review! Seema has everything a girl could wish for; stunningly beautiful and financially secure, she has a great job and a handsome, successful, caring fiancé. But then she loses it all! A freak accident leaves her horribly burnt and in terrible pain. Her hospital bills are mounting, her job is at stake and she will carry the scars to her grave. Worst of all, her fiancé seems to be losing interest in her. Seema thinks she has nothing left to live for, but her doctor is determined to heal and get her back on her feet–whether she wants to or not. With his faith as her bedrock, Seema learns to stand again and reclaim all that she had lost, including her true love. Seema is a beautiful young manager of an IT company who is engaged to Manoj, a successful banker. The book starts with a freak accident (caused by Manoj) that totally scars Seema all over her body. She is filled with burns over her legs, arm and lower half of the body. The doctors are hopeless of a full recovery and Seema rues the loss of her beauty. But her fiancé Manoj helps her into a hospital where a doctor suggests an expensive procedure for recovery. Seema hates the fact that the burns have rendered her immobile and she detests the doctor who seems very indifferent to her plight. She refers to him as ‘the beast’ and slowly realises that he is indifferent because of his past. Enter into the plot Seema’s colleagues who have almost managed to ruin the office by negligence in her absence. They have lost important contracts and they have made the company turn over in loss. Seema now has the double job of coping with her physical pains as the burns heal slowly and also to keep a drowning office afloat. Her boss is no longer interested in maintaining the branch of the office where she is working. Bank notices for closure of the office force Seema to rethink her position. Closing the office would mean more than 40 people losing their job and Seema wants to do something to keep both the office and the job intact. What she does further and the life changing decisions she makes in a short span of time form the rest of the story. 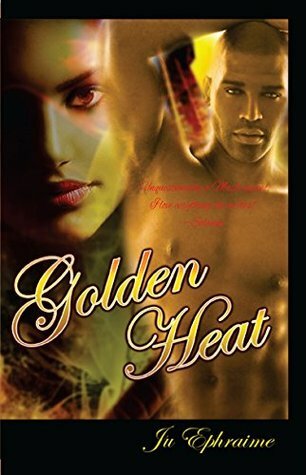 The lead character Seema faces betrayal from all ends, even her family, and she has work problems to solve within a deadline. 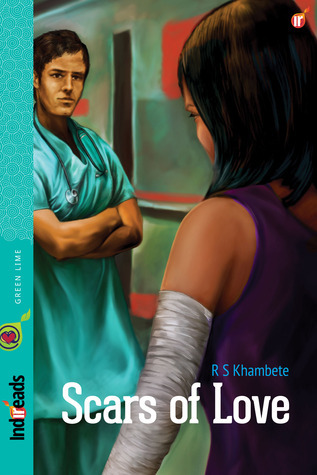 Her boss is callous, her doctor is seemingly indifferent and Seema does not know where to turn. Even her fiancé who once found her so attractive would only approach her in a patronizing way. Feeling pressurised from all ends, Seema makes some bold quick decisions that give a total twist to the story in unimaginable ways. It is here that the lead character leaves readers with a mildly disbelieving incredulous look. Seema, though she describes the doctor as an indifferent person (and that is the only negative thing she does through the whole story) is a really loving person towards everyone else. She is simply too good to be true. I personally would have liked Seema to teach a lesson to her cheating fiancé and betraying sister. And a little more background story of the doctor would have made this one interesting read. Talking about the story as such, it has clean simple language and is a delight to read. (As is usual with indiReads novellas). The premise of the story itself is very simple. The plot explains how one woman faces difficulties in life and comes out of it. The story develops on this single line in multiple directions. The characters are well developed and most stand in mind for their dialogues and behaviour. Seema, though she is the heroine is only my second favourite character. The first of course is the doctor and one character I really loved was Qutubuddin Filmrollwala. I have never enjoyed so much while reading about any other character in recent times. 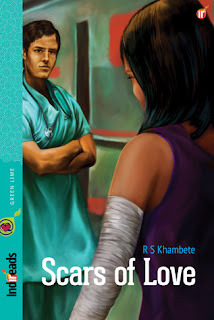 Overall, Scars of Love is an interesting story. You would take back important lessons from it. Qutubudin Filmrollwala. No other explanation needed. And the characterisation of the doctor. And through most of the book, I really did like the lead character, Seema. Excellent editing makes the book a treat to read. The cover design could have been a bit better. The image is not clear and doesn’t portray what the story is about. VERDICT: Go for this! It is a fast moving story with enough twists and some melancholy. My Name is Dhivya Balaji and I am a book blogger and reviewer with Readers Muse. I am participating in the tour organised by iRead book tours and am reviewing your book ‘Lola’s Money’. Thank you for agreeing to answer some questions that I have for you. I’m really pleased that you enjoyed reading ‘Lola’s Money’. That’s the main thing every author wants to hear from readers. I hope the following answers to your questions are the kind of replies you’re looking for. RM Note: Special thanks to the author for patiently answering the questions. I enjoyed reading these as much as reading the book! Q. Usually people think winning the lottery is the ultimate luck. What prompted you to write a story that mentions the difficulties faced once the lottery is won? Is this based on some real events? A. I had been sitting at my desk finishing my previous novel (April’s Man) and wondering if I would soon get an idea for another one. Before I closed my laptop for the night, I decided to check my Lottery ticket. That made me think about what it would be like to win the jackpot and the changes it would bring. The idea of starting a new story began to merge with thoughts of what it would be like to win a great deal of money – and ‘Lola’s Money’ was conceived. I have no personal experience of substantial monetary wins, unfortunately! I simply projected my thoughts into the practical changes a big win would bring and the attitudes other people would be likely to display, given the basic instincts inherent in human nature. Q. What do you think is the most exciting part of actually winning a lottery? A. 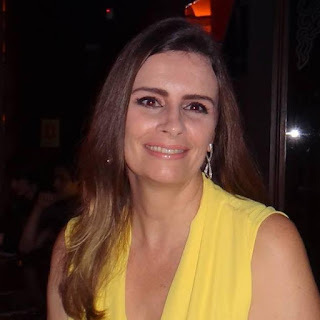 All of a sudden you would have a great deal of freedom, including freedom from financial worries, and you would have the power to do anything you wanted to do, including helping others. It’s a ‘wish fulfilment’ dream come true. You would feel that Fate or Lady Luck had smiled on you, and that would be very pleasant and exciting in itself. If it happened to me, I think it would instantly make me feel enriched and empowered in every way. No other financial event could touch every corner of your life quite so overwhelmingly. A. My husband and I went on a Mediterranean cruise a few years ago to celebrate our Silver Wedding Anniversary. We both enjoyed it very much. The friendliness and attentiveness of the Filipino staff (which I mention in the book) was something that stayed with us long after the cruise. When they served a course at the evening meal, they would always say, “Enjoy your soup!” or Enjoy your meal! ”. Alex and I still say that to each other now and again, when sitting down to a meal or when being served in a restaurant. Also, as soon as someone leaves their cabin on a cruise ship, the staff re-make the bed and tidy anything else that needs tidied. We used to joke that, on coming out of the ensuite bathroom, you almost expected to find the bed re-made! Q. Which character is your favourite among all those you have created? A. My favourite character in ‘Lola’s Money’ is Betty French, Lola’s mother. She is an honest, no-nonsense sort of person who puts herself out for her daughter without being pushy or interfering. She talks to her as an equal and tries to give her good advice when she feels it’s needed. I don’t have a daughter myself – I have three lovely sons – but I hope I have achieved the kind of good parenting balance that Betty achieved with Lola. In fact, I think Betty is my favourite character out of all those I have created, including those in my four previous novels. A. I had a bad experience with my first novel, which I originally called ‘Living a Lie’. I presumed titles came under copyright laws, as they always used to do, and that if my publisher accepted it, then no one had already used it. But when I went online to view my book after publication I was dismayed to discover that I had used the same title as one of Josephine Cox’s novels! Since then, I keep my titles very specific. I wanted to use a picture of a cruise ship sailing across open seas for the front cover of ‘Lola’s Money’, but liners are all individually named and belong to shipping companies, so I would have had to get permission from the company and also make sure that that particular ship cruises the areas covered in my book. 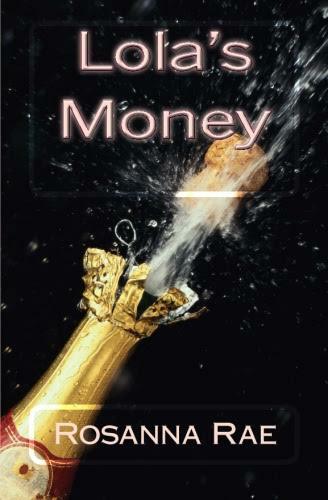 I didn’t want to do that, so I browsed CreateSpace’s picture gallery and saw the champagne bottle picture. It fitted the bill perfectly. In conjunction with the title, it conveys the book’s theme very effectively. A. I was first inspired to become a writer after reading Charlotte Bronte’s ‘Jane Eyre’. I liked everything about the book: the direct writing style, the characters and the story itself. I felt that the things Jane was passionate about were a reflection of what Charlotte herself was passionate about. It all came from the heart. In my teens, I read Evelyn Anthony’s books and enjoyed them very much, despite not being a politically-minded person myself. There was so much awareness of the human condition in them and also strong psychological profiles of wrongdoers and their motivations. My most recent enjoyment within my own genre of romantic fiction has been reading several of the novels of Nora Roberts, whom I admire very much. Q. Could we expect any more books from you? A. I am currently writing my sixth book. It’s entitled ‘Hazel’s Home’. It’s about a young Scottish woman who works for a large, international advertising agency. When Blake Hennessey, the boss (and owner) of the company, requests that she travel to New York to work on a project for an important new client, she flies off to Manhattan. As soon as Blake and Hazel meet, they fall for each other. Their relationship seems doomed, however, when they have a major argument that causes them to separate. Hazel has a great deal to learn – and to suffer – before she finally finds her true home. I am only about halfway through the first draft, so I don’t expect to complete the new book until well into next year. When Lola and her mother excitedly set off on a Mediterranean cruise, it’s not long before they both meet men they are interested in. However, their holiday of a lifetime catapults them into a life-changing sequence of dramatic and terrifying events that neither of them will ever forget. When she has to return to reality, Lola unexpectedly finds herself involved with Tom again! But the storm clouds are looming overhead, and as the recent past catches up with her and forces her to confront violence and danger once more, Lola risks losing Tom forever. Lola’s Money – the other side of the coin. That sums up the one word description I wanted to give about this book. Usually, most people think winning the lottery would be the ultimate luck and imagine the countless opportunities it would provide. But the reality is a tad different. Lola’s money is a unique take on what really happens after you actually win the lottery – once the hullabaloo surrounding the winning is over. It deals with problems like resentful colleagues, people fishing for money, opportunist people suddenly becoming friends and the whole hassle of not having even a moment of peace and quiet. But, the upside is having a lot of money that could be spent in unimaginable ways. Lola’s Money shows both sides of the whole lottery game. The actual process of money transfer is not shown clearly (It isn’t necessary to the plot) but the finer aspects of the lead character’s life are portrayed in great detail. Lola, an unassuming woman in her late twenties wins the lottery. Her first reaction is disbelief then shock. Once she gets over all that, she does a few things she had been waiting to do even before the money came. She plans to have a happy, relaxed life. But what Lola doesn’t count on are the resentful people around her who initially seem happy but are slowly getting antsy. Very soon, Lola faces problems wherever she goes. A planned cruise goes horribly wrong and everything she loves is put at stake. How Lola comes out of that and whether or not she keeps the money she has won forms the rest of the story. The plotline has a one word description that slowly spirals in different depths. There is kidnapping, manhunt, failed or turned down romances, office spite, mad exes trying to ruin the money and an estranged father in the plot. The author has managed to thankfully paint each and every character clearly, if not deeply. Sometimes you can get so frustrated with the lead character that you feel yourself wanting to shout at her and ask her to see sense. But Lola manages to see her problems through to the end. The supporting characters mostly steal the show with Betty, Lola’s mother, being a top favourite and Tom, her office love interest, being a close second. The story has a linear progression and is a clear glass from start to finish. The language is simple and save a few typos and obvious proofreading errors, the overall book reading experience is pleasant. Thanks to the author for bringing out the other end of winning a lottery. Rosanna Rae is married with three grown-up sons and lives in Livingston, Scotland. She has a B.A. (Open) in Social Science subjects and also took a writing course with The Writers Bureau some years ago. She spent 16 years at home raising her family and then returned to full-time secretarial employment in Edinburgh. Rosanna has wanted to write fiction since she was ten years of age, after reading an abridged version of Charlotte Bronte's Jane Eyre. She is delighted to be now fulfilling that early ambition. 'Lola's Money' is the author's fifth novel; she is currently writing her sixth book. 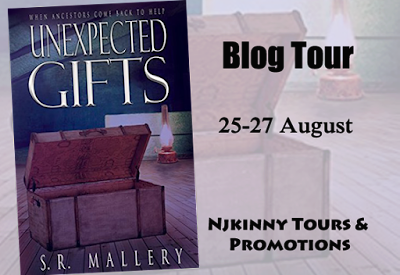 Having read another book ‘Sewing Can Be Dangerous and Other Small Threads’ by the author S R Mallery previously, I picked up ‘Unexpected Gifts’ with high expectations. And I loved this book every bit as much as I loved the previous one. To say that the author has got a unique gift of story telling would be an understatement. 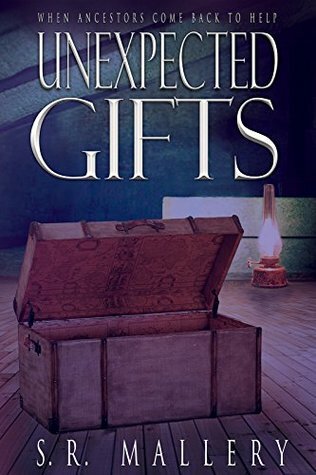 Unexpected Gifts is a story about how a woman’s past and ancestors indirectly give her a unique gift – the stories of their lives from which she learns how to live her life and stop doing the mistakes she is doing. Sonia is a woman who is spiraling towards addiction in a modern world and does not have much luck in choosing a right man for herself. She makes mistakes even though she knows they aren’t good for her and ends up being confused and borderline OCD most of the time. A chance talk with her mother, Lily, and subsequent discovery of an old family treasure trove that contains various letters, mementoes, artifacts of her ancestors gives her a glimpse into America’s history and what everyone had been through. She applies the lessons from the past in her current life and learns to correct herself and stop making decisions that are bad for her. The overall plot of the story is its amazing attraction point. It covers the many important parts of the history of America over various periods of time from different perspectives and gives the reader a great sense of having actually lived during those time periods mentioned. The book is almost a time travel classic without the science fiction element. Mallery doesn’t need the help of other devices and high technology gizmos (by including into the storyline) to transport her readers over different time periods – she easily does it with her words. The story in itself is about a woman’s self discovery by lessons from the past. The plot can be easily explained in one line from which the master quilter weaves a beautiful story that spans generations and sometimes even nations. The story is one of a kind in its simplicity and also the placement of various historical events all through the book. If history books covered the whole history of a nation aided by beautiful prose like this, History would be everyone’s favorite subject. The story of Sonia and her life is much more about the story of her ancestors and everyone who has a lesson for her life. The final twist with Billy R (not giving away spoilers!) is one of the best turning points I have seen in recent books. Beautifully written, very engaging page turner. 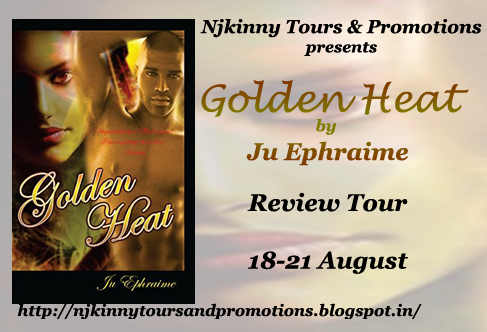 Welcome to my stop on the Review Tour of Golden Heat by Ju Ephraime. This is a spicy romance with an intriguing twist of mystery. Andy Redfield is a hard-nose real estate developer, trying to settle his father’s estate and locate the treasure that was mentioned in his father’s will. Bernie Harp is a no-nonsense, private investigator, and who specializes in locating lost objects. When Andy hires her to find his dad’s treasure, she anticipates working alone, as was her custom. She communicates this to Andy in no uncertain terms, but Andy was having none of it. If anything, he was more determined than ever to lend his assistance. When finding the treasure becomes more than a routine job, and the presence of a suspicious intruder is discovered, tempers flare and sparks fly. While they have difficulty seeing eye-to-eye, Andy and Bernie agree on one thing: They need to capture the intruder and locate his father’s treasure. Andy Redfield – Alpha male, refuses to accept, even to himself, that women have an allure that has the power to bring men to their knees. 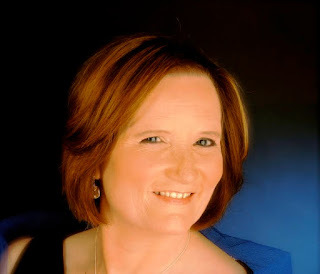 Bernie Harp – a strong willed woman who wishes, ardently, that men would stop judging her based on her looks (being too beautiful) and instead give her credit for the intelligent work that she does. She tries to prove that it is not her good looks alone but her talent that should make men respect her. What happens when both these people meet forms the rest of the story. Andy needs an investigator to find out property his father has hidden. He has searched all expected places and has turned up empty. He requests the help of his friend James, who in turn suggests Bernie. Andy knows since the moment he first lays eyes on her that this was going to be a difficult job because he would have a hard time controlling mingling business with pleasure. Little did he expect that someone with a name like Bernie would be a woman – and such a hot one at that! The story traverses on the predictable path from then on. The lead characters are both strong willed and refuse to accept the obvious attraction and even though the readers could guess where the story is heading, one cannot simply put the book down once started because of two reasons. It is smaller than the regular book and therefore you justify reading with ‘Just this page and I am done’… which eventually doesn’t happen because at no point in the book is there a gap where you could keep it down and sit in peace. The book is racy from start to finish. The plot is not very elaborate. Two people who are attracted but refuse to bow down to the obvious pressure and try to act superior while hiding their real intentions. They meet and sparks fly from scene one. What happens to the business that actually brought them together and how they end up is everyone’s guess. There is nothing much to comment on the story except that it is very, very engaging and sometimes so… hot. The reviewer has a tongue in cheek while writing this review because it is one hell of a ride that was very loved! The book needs some obvious editing and proofreading. And sometimes you wish that the other characters had more scenes allotted to them. Sometimes it does feel like everything revolves around these two leads. But other than that, this book is a perfect afternoon read that would leave you with a grin in place for various reasons. I have not read other books by this author so I could not comment on the usual style. But overall, this is one book you won’t regret picking up! Visit her blog at http://www.juephraime.blogspot.com or her personal page at http://www.juliaeantoine.com where you can sign up for e-mail updates and be the first to hear about new releases. Find Ju on Facebook at https://www.facebook.com/juephraimeauthor. She loves to chat with readers. “Everybody thinks I work with prosthetics, implants, technology… Let me tell you: I work with lives. I restore part of the opportunities people have lost. They think I’m helping them, which I find rather amusing. I can’t take steps for them, nor can I remove the obstacles along the way as they adapt themselves to their electronic limbs and artificial organs controlled via Bluetooth. They are the ones who decided that they are ‘normal’ and stop looking at what they don’t have to focus on what they want to do with their lives. - The boy who developed the Eyeborg? - Yes, it is. As far as I remember, he is considered the first ‘cyborg’ in the planet. Amidst real events and landscapes, men and women like us wander the cities we inhabit, rehearsing happier lives in the pages of this motivational narrative. From each one, destiny took a part to make them perfect. When he is born, Andre propels his mother's life in a new direction. His father, an executive who organizes Olympic competitions around the world and doesn't know when to come back home, strives to make him a wordly citizen. 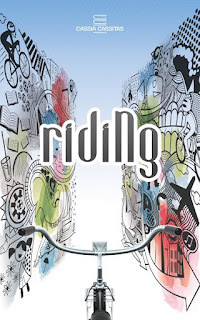 Cycling, his life acquires purpose: becoming an Olympic para-athlete. Together with his friends, he experiences disappointments and new beginnings. A doctor that builds robots, the daughter of a lonely teenager, and a retired athlete teach André how to overcome his limits and live his dream. Set in Curitiba with breaks in Los Angeles, Seoul, Johannesburg and Soweto, Barcelona, Atlanta, Sydney, Athens, Beijing and London, the narrative ends in 2012, in Rio de Janeiro. As a tribute to all those who choose to sign the next episodes of their lives, this book is about overcoming one’s self amid achievements, obstacles, love and heroism, written behind the scenes of life. The book is not the usual novel /novelette/ or an anthology. It is, for want of a better word, different. At first, it seemed like a journal entry, with each entry dated and read about a particular character and their relation to a common theme. Then I thought it was a collection of short stories that described the behind the scenes of Olympics and lives of athletes. Only after about a quarter of the book did I realise that it was a unique book. And while I was half way through, it finally hit me that this is a work that has been translated to English. It is enjoyable, nevertheless. The stories of Mario, Elizabeth and Andre are written with good phrasing and with messages given subtly. I really loved the vague and ambiguous mention of Paralympics and the actual connection with the stories. They are taking place over three decades and each event is significant (which is why you shouldn’t skim this book or skip pages even though it does seem a bit off point at times). But it really is a small book. You wouldn’t feel like skipping pages once you get past the translated words and delve into the story. True to its words, the summary is a short account of what you could expect from the actual story. The characters (even the nameless ones that are not mentioned clearly) have such a depth that the reader is left pleasantly surprised. The book takes you across continents and makes sure you are always expecting the next vivid visuals that the author is going to come up with. Though sometimes the descriptions are too elaborate, if you do like books that talk about life in various places and the nativity, you would love this book. There are times when every book lover has to choose between reading a book at a go and rushing to the end, or reading it a few pages at a time, savouring the pleasure of the written word. The book that makes the reader consider these options would either be too bad that it had to be finished quickly or could only be read a few pages at a time, or it would be too good, making the reader want to rush and see how it ends or slowly let the contents seep in by reading it in parts. Riding falls in the ‘too good’ category. Riding would not disappoint you. Go enjoy the ride! "In my mind, words came in strides. They aligned themselves in arguments that were ready for combat after rebelling themselves - and that was just inkling. Were was my certainty to support the new image? And where were my emotions, with their brushes to bring color to life?" Born in the interior of the state of Paraná, Cassia Cassitas accumulated various degrees throughout her carreer in Information Technology. The author of three novels, her texts convey ideas accumulated amidst the smell of coffee plantations, shoe factories, and the technology of the 20th century. These texts deal with life-altering episodes, in a path lit by a harmonious blend of memories and imagination.